What is Home Theater? Is it a dedicated room with a bunch of chairs, built to mimic a movie theater but more comfortable? We can do that, but how about a family room, living room, or other room that serves several purposes – a room where you and your family can watch a movie, binge your favorite Netflix shows, play video games, watch the game, play a concert video, or listen to music? OK, for bests enjoyment of movies you need seating that faces the screen. Ideally you need a large high-resolution projected image. Probably a minimum of 120″ wide 2.35:1 screen. You need to be able to dim the lights seriously and have some lighting like in a theater that allows you to see to walk out. For football you probably what a bright flat screen TV, that works well in a moderate level of ambient light. You can of course have both, a flat panel TV on the wall with a movie screen that drops in front of it. The 120″ screen viewing distance for movie experience will be 12′ – 16′. The flat panel Tv can be whatever size you want to invest in, perhaps 65″ diagonal 1:78:1 (16×9). You don’t need a dedicated theater room that might be used only occasionally. We can bring stunning cinema to any room in your home in a way that suits your family and lifestyle. Crank it up, put your feet up, grab a drink, and relax. Hidden in every theater we put together a great stereo system. Our theater audio systems provide sound that makes movies exciting, conveying the emotion of the movie. If a theater system does that successfully, it is also a great music system and can be used for stereo music or multi-channel music. 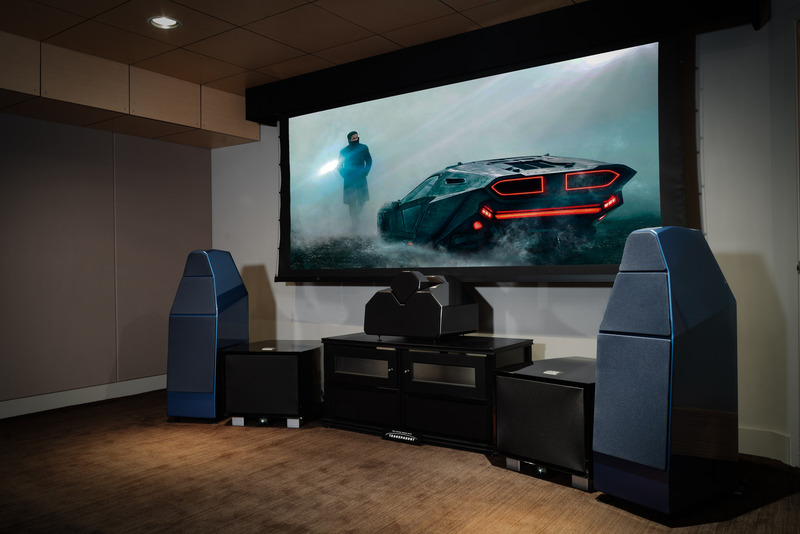 What makes a good audio system for both movies and music? The usual minimum is three front channel speakers plus two surround sound speakers, and a Low Frequency Effects (LFE) channel (subwoofer). If the multi-channel audio is a movie sound track, the LFE channel is specifically recorded and determined by the recording engineer. This is a 5.1 channel recording. A 7.1 channel recording and system involves four separate surround channels, two side channels and two rear channels. The bass from all the channels can be delivered to the subwoofer(s) reproducing the LFE channel. The center channel can be folded into the left and right front channels, if necessary, but the quality of the sound is substantially decreased. You can have decent reproduction of a multi-channel movie sound track on a two-channel system. This is a compromised approach but better to have two good channels than multiple bad ones. The center channel in some sense is the most important. It conveys the dialogue which must be articulate. if this is done properly it adds clarity and conveys the subtlety of the dialogue. 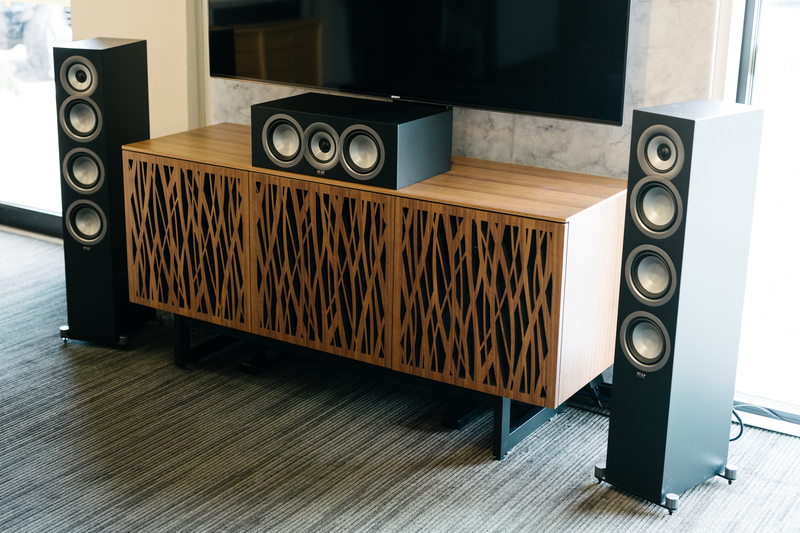 In a multi-channel system, it is important for the center channel speaker to be very good, full sounding, and articulate. That is the dialogue channel. Some speaker makers don’t pay much attention to the center channel speaker but it is critical to understanding the dialogue. The surround channels heighten the sense of immersion in the film. The separate woofer or woofers provide impact and increase clarity if accurate and properly installed. One is essential for the effects channel. We recommend a minimum of three. One for each front channel. The system will benefit from additional subs for the surround channels. Sound confusing? We can simplify it and make a system that fits your room, your lifestyle and your budget. We strive to make good sounding audio systems for movies and music. It is critically important that the system be setup and dialed in correctly. This is a complex skill that we have learned over decades of experience. We have some of the most experience and best people in the business. Even a system with great components will not sound good if it is not properly set up and dialed in. Completing the theater experience is stunning video. We trust our long-term installation specialist Jim Wichita for everything video. He is an expert for both projection and flat panel video solutions. No matter your needs for video, we can execute high performance video that is natural looking, engaging, and cinematic to compliment the audio. Jim knows exactly how to adjust the video display be it projection or flat screen for best performance. He has vast experience in this areas stretching back more than 30 years. We can supply projection or flat panel video that meets your budget whether you want a 42″ screen or a 120″ screen. With higher performance systems, room acoustics become important. We can do subtle but important room acoustic treatment. We have been doing it for many years. We have learned a lot. There are multiple ways to bring theater into your home! Five little speakers included in most “home theaters in a box” will not do a great job. 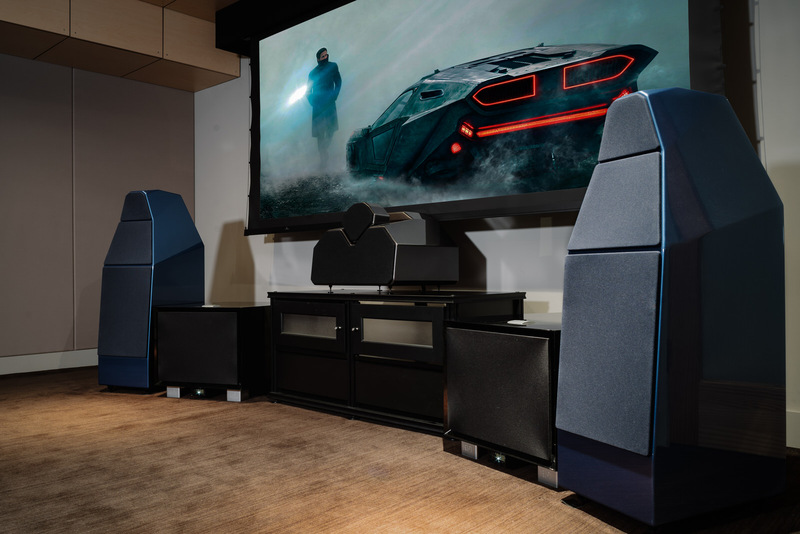 If you must have a system that is sleek or hidden, we have ways to achieve that without sacrificing sonic performance. We can do very good speakers that are on-wall/in-wall/in-ceiling or we can deviously hide speakers behind a fabric wall or put them in a cabinet. We are skilled at maintaining performance in unusual circumstances. In a very good system the front channel speakers are most important. The surround speakers must have a sound quality that blends with the front speakers but can be in-wall or in-ceiling even if the front speakers are not. The quality of the woofer(s) and their placement and setup is also critical not only for sub-bass impact but for mid-range clarity. Let us demonstrate what quality sound adds to the already excellent video available from today’s flat screens and projectors. Quality sound to go with your video needn’t be breathtakingly expensive or physically overwhelming. 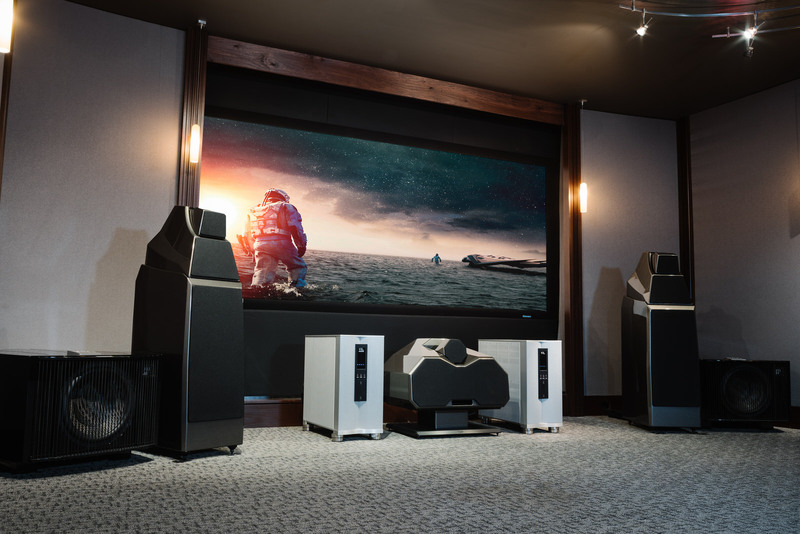 Stop in, enjoy some fun demonstrations and have a conversation with one of our consultants about a new system or updates to your current theater setup. Discover what is possible. Our trade up program makes it possible for you to get where you would like to be in steps. 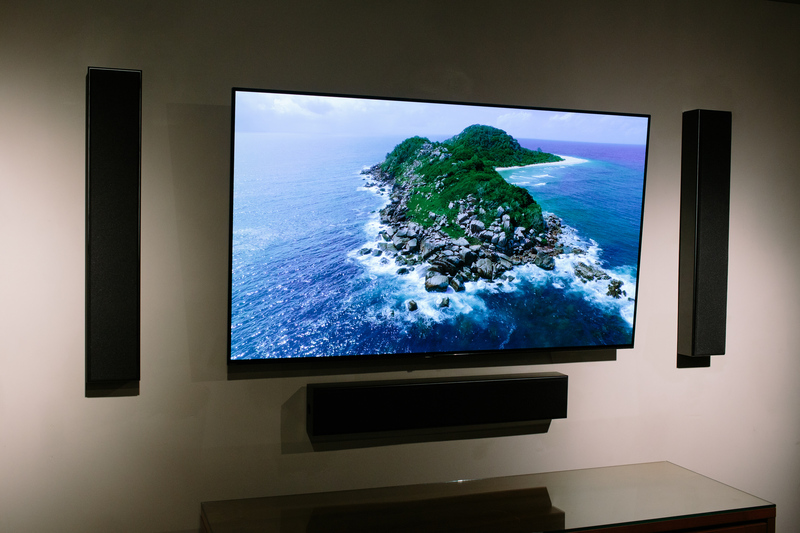 We currently have three theater systems on demonstration in our showrooms. Two of them incorporate a traditional approach using freestanding speakers while one system displays a Sony 4K OLED TV and complete on-wall/in-wall theater system that offers uncompromised performance and can fit into any room in your home easily without encumbering space. 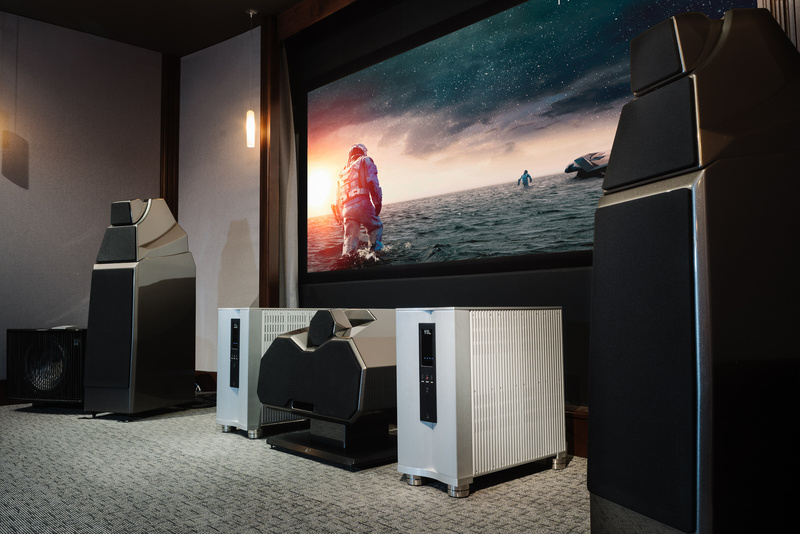 Our multi-channel audio systems for home theater start at about $3,000 but we can find a way to start with a two-channel system for you that can be built to multi-channel in easy steps. For instance, a Naim Mu-so at $1,000 makes an excellent start from which you can easily trade up with our generous trade up program. Come in for a visit. Talk to us. We can come up with a solution suited exactly to you.